The French sounds suitably fashionable, the German commonly practical, the Spanish somewhat more exotic and the Irish quite comfortable for a language I’m still learning. Slowly. (Two days later: found out when nouns follow numbers in Gaelic, they stay in the singular). I’d made a couple of rag rugs some years ago and was amazed at i.) how much warp they required and ii.) how quickly they wove up. The first has become a foot mat under the loom pedals, whilst the second is stretched out in glorious tri-colour in the back room. This time the task was to get through the pile of old jeans and t-shirts that had grown to the right size for harvesting. The two jeans rugs came out at c. 27″ x 45″ minus the fringes. I’d aimed for 50″ long, so this wasn’t far off. One used 3 pairs of adult male jeans in large, the other 3 1/2 pairs (different sizes). The weft was cut into 1″ strips (more or less), and the binding was approximately half the width, cut from a linen shirt. Actually I have to admit that one of the large pairs was XXL. I’d run out of jeans and saw that they were only $7 new in one outlet, so naturally went for the biggest size I could get. Probably cheaper than an op shop, too. The t-shirt rug is currently 25″ x 58″. It was on the same warp as the jeans, so I guess the stretchiness of the materials played back on itself. I followed Ton Kinsely’s advice in Weaving rag rugs and cut the t-shirts – 16 of them up to the arms – across, then stretched out the loops joining them by, well, looping the loops. 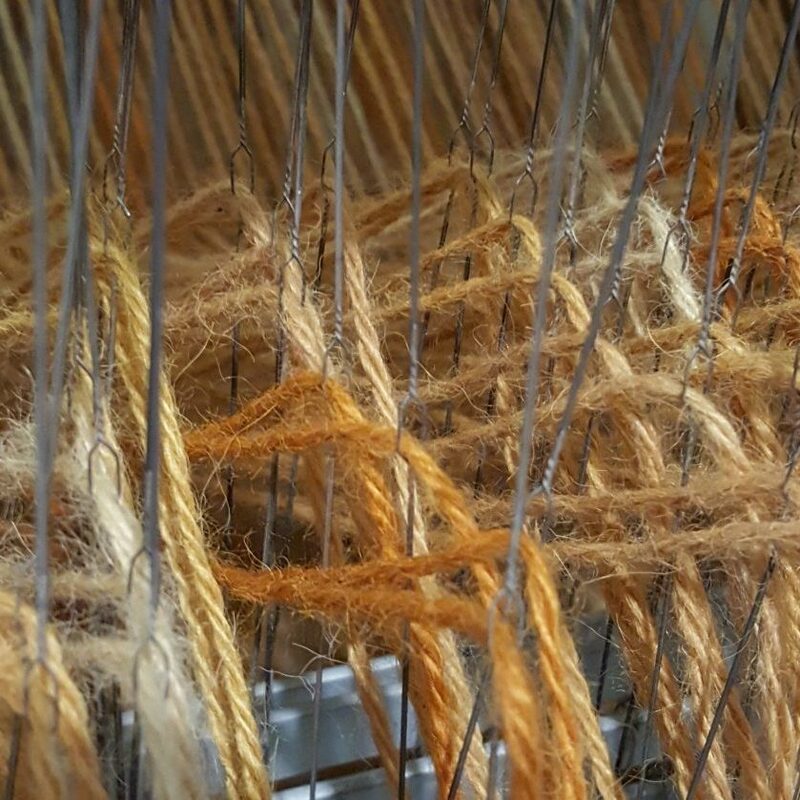 The binding was the same as the warp – linen warp yarn. The rug is quite sturdy and sits flat at the end of the bed. All the rugs are actually straighter than they appear in the photos (honest! ), and after Mr Knisely’s comment on the DVD (you don’t need both DVD and book as they are in total accord) about never getting perfect edges because they’re rag rugs, I felt better. Here’s an interesting Swedish site (in English) on the history of rag rugs: Story of a rug. Posted on March 16, 2018 by hedgerowweaver. This entry was posted in weaving. Bookmark the permalink. I warn you, it’s as addictive as any craft!